I'm a sucker for a drop-wait skirt. I instantly loved this one for it's airy style that's sure to become one of my season staples. This woven dress is decked in an easy vintage print and was so easy to pair with my favorite booties. I gotta say though, I can't to wear it with my tall boots as well. I love this style of dress too. The print on it is so perfect for fall. Very sweet weekend look! It's both feminine and boho at the same time! Thanks for linking up with us on Start The Week Stylish! Love the dress!!! You look so great! The pictures are great too!! 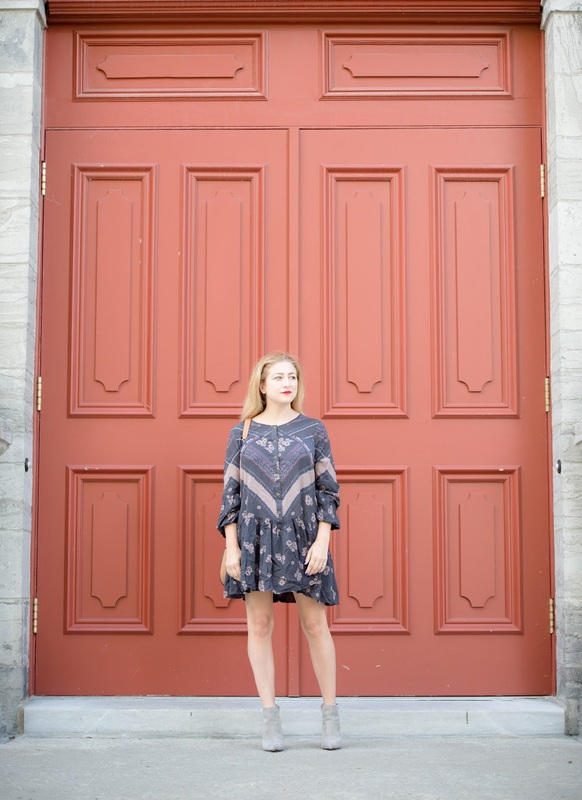 those doors are the best backdrop! well done! and fab shoes too of course. This dress is amazing.......you look phenomenal!!!!!! That dress is fantastic!! I love the loose, flowy shape and the print. It's perfect for fall with those fabulous booties! So cute! I'm all about a dropped waist dress! Very cute dress! I love the billowy cut and pretty print! What a fun dress, it looks so comfortable! Love this style, as well! Really pretty! Loving this effortless dress. Too pretty & great photo location! Those prints are beautiful! Such a fun, easy to put together look! I love this whole look! The dress is so pretty and I love that bag! Those booties are really chic too! A great dress on you and loving your purse too! I love your shoes! Great outfit! Such a sweet look! Love it, Crissy! Thanks so much for sharing with Fun Fashion Friday! What a great fall look! Fabulous dress and so perfect with your booties. Thanks for linking up with Fabulous Friday!